Metropolitan Planning Council released a blog highlighting the Calumet Connect project and the work of GCI staff Jackson Morsey and Jack Rocha to engage residents, businesses, and community organizations in bringing more resources to the Southeast Side and utilizing the Calumet River as an asset for the communities. 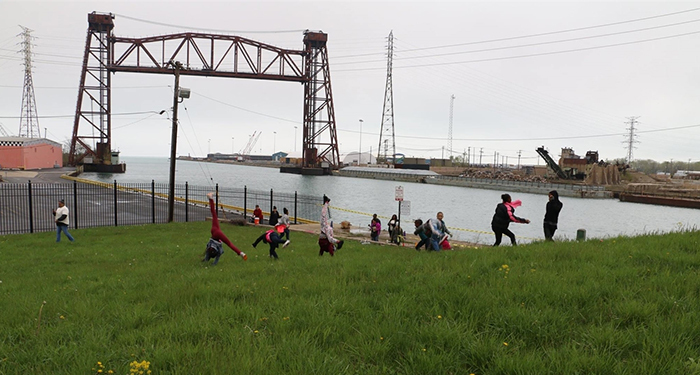 The Calumet River is an invisible asset to most residents on Chicago’s southeast side. It unites the entire Calumet Region under its economic umbrella of heavy industry, yet physically divides many of its neighborhoods and is generally inaccessible to residents. Jackson Morsey, an urban planner with the Great Cities Institute (GCI) at the University of Illinois at Chicago (UIC), recalls that residents hardly interact with the river. “The Calumet River is essentially invisible to the surrounding communities and has prevented residents from perceiving it as a community asset,” Morsey says.